Kazakhstan is a unitary republic. Its first and, to date (2016), only President is Nursultan Nazarbayev. The President may veto legislation that has been passed by the Parliament and is also the commander in chief of the armed forces. The Prime Minister chairs the Cabinet of Ministers and serves as Kazakhstan’s head of government. There are three deputy prime ministers and sixteen ministers in the Cabinet. Kazakhstan has a bicameral Parliament composed of the Majilis (the lower house) and Senate (the upper house). Single-mandate districts popularly elect 107 seats in the Majilis; there also are ten members elected by party-list vote. The Senate has 47 members. Two senators are selected by each of the elected assemblies (Maslikhats) of Kazakhstan’s sixteen principal administrative divisions (fourteen regions plus the cities of Astana and Almaty). The President appoints the remaining seven senators. Majilis deputies and the government both have the right of legislative initiative, though the government proposes most legislation considered by the Parliament. 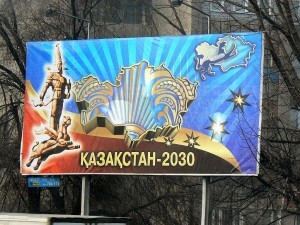 A”Kazakhstan 2030″, billboard promoting the president’s economic plan, 2008, Almaty. 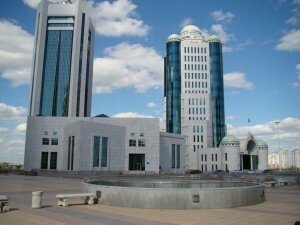 Elections to the Majilis in September 2004, yielded a lower house dominated by the pro-government Otan Party, headed by President Nazarbayev. Two other parties considered sympathetic to the president, including the agrarian-industrial bloc AIST and the Asar Party, founded by President Nazarbayev’s daughter, won most of the remaining seats. Opposition parties, which were officially registered and competed in the elections, won a single seat during elections. The Organization for Security and Cooperation in Europe was monitoring the election, which it said fell short of international standards. Kazakhstan is a member of the United Nations, Organization for Security and Cooperation in Europe, Euro-Atlantic Partnership Council and the Organisation of Islamic Cooperation (OIC). It is an active participant in the North Atlantic Treaty Organisation Partnership for Peace program. 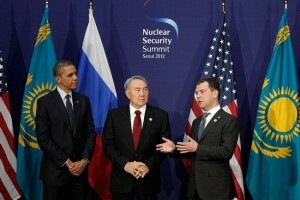 In April 2011, President Obama called President Nazarbayev and discussed many cooperative efforts regarding nuclear security, including securing nuclear material from the BN-350 reactor. They reviewed progress on meeting goals that the two presidents established during their bilateral meeting at the Nuclear Security Summit in 2010. Kazakhstan is also a member of the Commonwealth of Independent States, the Economic Cooperation Organization and the Shanghai Cooperation Organization. The nations of Kazakhstan, Russia, Belarus, Kyrgyzstan and Tajikistan established the Eurasian Economic Community in 2000, to revive earlier efforts to harmonise trade tariffs and to create a free trade zone under a customs union. On 1 December 2007, it was announced that Kazakhstan had been chosen to chair the Organization for Security and Co-operation in Europe for the year 2010. Kazakhstan was elected a member of the UN Human Rights Council for the first time on 12 November 2012. Since independence in 1991, Kazakhstan has pursued what is known as the “multivector foreign policy” (Kazakh: көпвекторлы сыртқы саясат), seeking equally good relations with its two large neighbours, Russia and China as well as with the United States and the rest of the Western world. Russia currently leases approximately 6,000 square kilometres (2,317 sq mi) of territory enclosing the Baikonur Cosmodrome space launch site in south central Kazakhstan, where the first man was launched into space as well as Soviet space shuttle Buran and the well-known space station Mir. Since 2014 the Kazakh government has been bidding for a non-permanent member seat on the UN Security Council for 2017–2018. On 28 June 2016 Kazakhstan was elected as a non-permanent member to serve on the UN Security Council for a two-year term. Kazakhstan actively supports UN peacekeeping missions in Haiti, the Western Sahara, and Côte d’Ivoire. In March 2014, the Ministry of Defense chose 20 Kazakh military men as observers for the UN peacekeeping missions. The military personnel, ranking from captain to colonel, had to go through a specialised UN training; they had to be fluent English and skilled in using specialised military vehicles. In 2014, Kazakhstan gave Ukraine humanitarian aid during the conflict with Russian-backed rebels. In October 2014, Kazakhstan donated $30,000 to the International Committee of the Red Cross’s humanitarian effort in Ukraine. In January 2015, to help the humanitarian crisis, Kazakhstan sent $400,000 of aid to Ukraine’s southeastern regions. President Nazarbayev said of the war in Ukraine, “The fratricidal war has brought true devastation to eastern Ukraine, and it is a common task to stop the war there, strengthen Ukraine’s independence and secure territorial integrity of Ukraine.” Experts believe that no matter how the Ukraine crisis develops, Kazakhstan’s relations with the European Union will remain normal. It is believed that Nazarbayev’s mediation is positively received by both Russia and Ukraine. Most of Kazakhstan’s military was inherited from the Soviet Armed Forces’ Turkestan Military District. These units became the core of Kazakhstan’s new military. It acquired all the units of the 40th Army (the former 32nd Army) and part of the 17th Army Corps, including six land-force divisions, storage bases, the 14th and 35th air-landing brigades, two rocket brigades, two artillery regiments and a large amount of equipment which had been withdrawn from over the Urals after the signing of the Treaty on Conventional Armed Forces in Europe. Since the late 20th century, the Kazakhstan Army has focused on expanding the number of its armoured units. Since 1990, armoured units have expanded from 500 to 1,613 in 2005. Kazakhstan’s National Security Committee (UQK) was established on 13 June 1992. It includes the Service of Internal Security, Military Counterintelligence, Border Guard, several Commando units, and Foreign Intelligence (Barlau). The latter is considered as the most important part of KNB. Its director is Nurtai Abykayev. Since 2002 the joint tactical peacekeeping exercise “Steppe Eagle” has been hosted by the Kazakhstan government. “Steppe Eagle” focuses on building coalitions and gives participating nations the opportunity to work together. During the Steppe Eagle exercises, the Kazbat peacekeeping battalion operates within a multinational force under a unified command within multidisciplinary peacekeeping operations, with NATO and the US Military. “The law does not require police to inform detainees that they have the right to an attorney, and police did not do so. Human rights observers alleged that law enforcement officials dissuaded detainees from seeing an attorney, gathered evidence through preliminary questioning before a detainee’s attorney arrived, and in some cases used corrupt defence attorneys to gather evidence. Kazakhstan’s global rank in the World Justice Project’s 2015 Rule of Law Index was 65 out of 102; the country scored well on “Order and Security” (global rank 32/102), and poorly on “Constraints on Government Powers” (global rank 93/102), “Open Government” (85/102) and “Fundamental Rights” (84/102, with a downward trend marking a deterioration in conditions).